Our scrubs are made with sugar instead of salt so they are exfoliating enough for your feet and elbows but gentle enough to use on your face. Never used a scrub before? 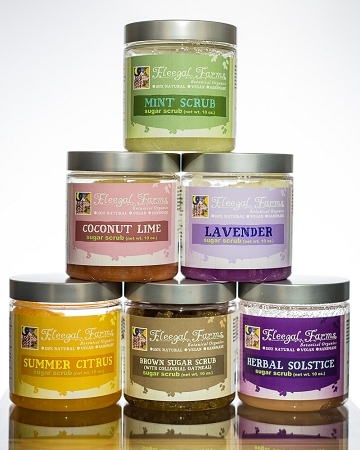 After cleansing in the bath or shower, take out a handful and scrub your body everywhere! Step back into the water and rinse off. Pat dry with a towel and enjoy your beautiful new skin. 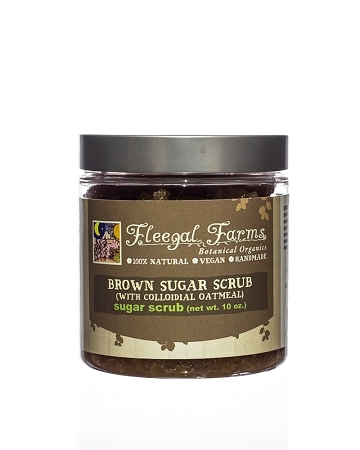 This scrub is scented with vanilla and cinnamon essential oils. The finely ground oatmeal and brown sugar work to polish your skin as the cinnamon warms your senses. A sweet way to soften and exfoliate. DIRECTIONS: Apply to wet skin to exfoliate and help moisturize dry skin. Scrub on and rinse off. Makes an amazing back scratch or foot massage. Can make bathing area slippery so step carefully. INGREDIENTS: Pure cane sugar (sucrose), brown sugar (sucrose) oils of olive (olea europaea), rice bran (oryza sativa), apricot (prunus armeniaca), sweet almond (prunus dulcis), avocado (persea gratissima), sesame (sesamum indicum), castor (ricinus communis) , and shea butter (butyrospermum parkii), pure essential oils, cinnamon (cinnamomum zeylanicum), organic oats (avena sativa).